Like other developing countries in the world, the major problem facing Cambodia is the serious lack of human resources for the country’s development, according to Professor David Jonathan Gross, a Nobel Laureate for Physics. Prof. Gross said through his lecture and dialogue with some participants and people he met, he observes that there are quite a lot of brilliant young people in Cambodia, which will be important for Cambodia’s future development, but the most important thing is whether they are given opportunity to develop their skills. Prof. 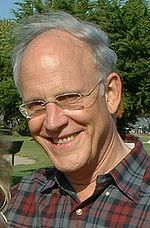 Gross is a Nobel Laureate for Physics in 2004. He has discovered and explored the force that binds particles inside an atomic nucleus. This phenomenon led to a whole new physical theory and enabled scientists to complete the standard model of particle physics, which describes the fundamental particles in nature, and how they interact with one another. Gross said there are two kinds of human resources. While the majority of people are just working forces, others have special talents and great minds, who make great contributions to the country’s development. This kind of people should be given special opportunity. Chek Chan Oeun, a physics lecturer at Royal University of Phnom Penh, who participated in the Professor Gross’s lecture, said the lecture paves the way for participants, especially for students to a broader scientific research and open their minds to how science can help social development. The visit by Prof. David Jonathan Gross intends to strengthen the relationship among nations in Southeast Asia and ASEAN with the rest of the world, according to the organizer. “It’s our aim really to build these bridges not only with Nobel laureates from the United States or Europe and the societies here in Southeast Asia, but between the societies in ASEAN to reach more cooperation on the level of education because education as we think is basic for peace and that’s why we are doing this program at the universities and at schools here in Cambodia and also in other countries in the region,” said Morawetz, director of International Peace Foundation. Born in Washington, D.C., Professor David Jonathan Gross, received his undergraduate degree from Hebrew University in Jerusalem in 1962 and then continued his education at University of California, Berkley, from where he received his Ph.D. in physics in 1966. He then served as a junior fellow at Harvard University. Professor Gross is now a director and holder of the Frederick W. Gluck Chair in Theoretical Physics at the Kavli Institute for Theoretical Physics of the University of California in Santa Barbara and a member of the Advisory Board of the Intentional Peace Foundation. As part of the “Bridges” program by the International Peace Foundation, the next Nobel Laureate who will pay a visit to Cambodia on January 20 is Professor Eric Stark Maskin, a 2007 Nobel Laureate for Economics.